In order to guarantee the achievement of 4D objectives and to efficiently manage related project complexity, a coherent work plan, over 3 years, has been developed. It is organized in 10 work packages clustered in Project Management, Scientific and Technical, Demonstration and Dissemination and Exploitation activities. Particularly, the RTD activities will map the 4D solution development lifecycle from the product and technologies design phases to processes and equipment design phases through to the data acquisition, control, integration and optimization phases. Use cases provided by the end-users give requirements for every design process related to the hybrid processes, the 4D mechatronic modules and hybrid solutions. Once the complete design and development stage will be developed, the actual outcome of the manufacturing processes, i.e. the aerospace, oil&gas and power generation products will be evaluated against the reference benchmarks. WP2 refers to the advanced product design and the development of 4D Engineering Platform for modelling and engineering the next generation of complex shape products designed by hybrid technologies. 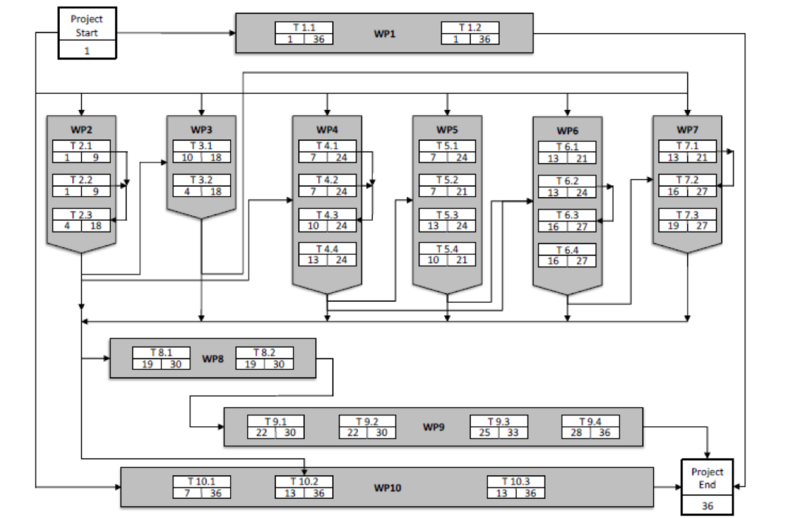 WP3 covers the activity of process design and planning where the actual manufacturing and repairing processes are developed on the basis of the various available technologies and the products and production requirements. WP4 regards the design and configuration of the 4D modules and their hybrid integrated solutions. WP5 addresses the design of the sensing system, including the complex vision infrastructure which will integrated in the 4D hybrid modules along with the scanning devices which will be utilize for component inspection. WP6 pertains to the control design that is responsible for operatively realizing the adaptations identified by means of sensing system. WP7 refers to the CAx software infrastructure development to support the closed loop monitoring, adaptation and optimization works by determining the process and mechatronics adaptations/compensations to be executed to match the part and production quality requirements. WP8 relates with the 4D solution integration and overall monitoring and optimization where all the aspects addressed at local level (e.g. process, equipment and powder) and at supply chain level are investigated and enhanced under a hierarchical optimization strategy across the green field manufacturing and maintenance stages of the product lifecycles. WP9 refers respectively to the development of 3 demonstrators for the reference industrial sectors. WP10 ascertains an extensive dissemination and exploitation activities with the aim of boosting 4D industrial solutions in future industrial practice. The targeted results planned across the project life are presented in the form of deliverables dealing with report, software and demonstrators; as some of the deliverables are considered strategically sensitive for the project success they are conceived and presented both in a preliminary draft and in a final forms. 4D faces complex development, integration and demonstration issues. Integration is particularly strategic and a specific workpackage (WP8), with a specific milestone will manage it. Furthermore, in order to avoid waiting m18 to face integration matters, a multi-loop development has been adopted with 5 major steps of alignment between necessary input and intermediate output. Alignment steps are planes at month 6, 12, 18, 24, 30 in correspondence with plenary meetings, whose agenda will include technical sessions to allow interdisciplinary discussion and manage interdependencies. An additional intermediate alignment by web meeting, in between plenary sessions, will be chaired by scientific and technical coordinator, to discuss and solve interdependencies among tasks belonging to separate WPs. 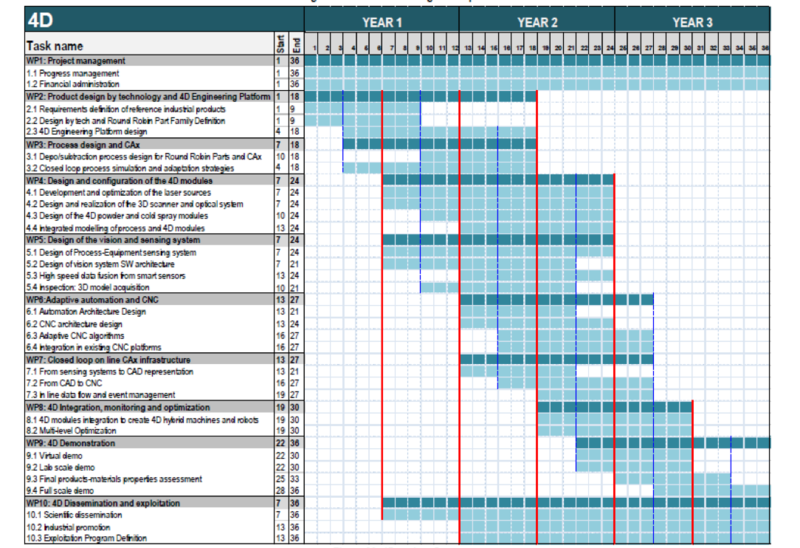 Major and minor alignment events are indicated in the GANTT with solid red and dot blue lines, respectively. Interdependencies are shown in the PERT diagram.